SS PRESIDENT HOOVER AGROUND during early stages of evacuation - 11 December 1937. Note rocks directly ahead of her appear closer than they are. Boats alongside to starboard. In an intriguing quirk of history, at almost the same time the Japanese Navy was embroiled in an international incident in the China sector with the sinking of USS PANAY, it was also involved in an international rescue effort. This concerned the 21,936 ton S.S. PRESIDENT HOOVER, one of the big liners of the Dollar Lines which were a familiar feature of the Pacific milieu. The Chinese aircraft reportedly had mistaken the big ship for the comparable Japanese transport, ASAMA MARU. How this error was made baffled everyone, since the liner had a large American flag on the top deck stretched aft of the bridge and was anchored in the usual holding position. A Japanese destroyer and British cruiser arrived in response to the message, but other than medics no help was needed. HOOVER had suffered only light damage, but she aborted the trip to Shanghai and immediately proceeded to San Francisco for minor repair before returning to the region. While so engaged in the winter of 1937, a second and mortal mishap took place. On 22 November, PRESIDENT HOOVER departed San Francisco for Japan. After calls at Yokohoma and Kobe, HOOVER left Kobe for Manila. Because of the crisis then enveloping Shanghai, the normal visit there and to Hong Kong were omitted. Instead Captain George W. Yardley was directed to make for the Philippines at all possible speed to arrive no later than 0600 the 12th taking a shorter and different route than usual. This new course came down to Formosa, then was to proceed southward along the eastern coast of Formosa rather than the Formosa Strait. The disadvantage of this was that at that time much of that coast was unfamiliar. Far worse, because of the wartime conditions, the Japanese who controlled the island had turned off navigational aids and lights. There were few lights of any kind to be seen, and HOOVER was having to navigate by dead recokoning. A deep mist had settled and the seas running choppy as the fast moving HOOVER arrived off Formosa's northern tip on 10 December and started down along the coast. When night came with the shore lights doused, visibility became extremely poor. After midnight Friday, PRESIDENT HOOVER was steaming along about 30 km off the southeast coast of Formosa, groping through dark seas and heavy mist. At about 0100, PRESIDENT HOOVER suddenly entered and struck shoal water with a series of moderate jolts. The engines were immediately stopped and the ship assumed a slight list to port. Incredibly, her navigation had proved so wanting that she had come within an ace of simply steaming onto the northwest side of the rather large Hoishoto Island (Green Island). As it was, she ran upon a reef of Chung-liao Bay. The alarms sounded, jolting many in their sleep and they began to gather topside as boats were cleared while damage was assessed. Sleepy passengers came out onto the Promenade deck and watched with concern while Captain Yardley reversed his engines briefly in an attempt to back the ship loose, but this failed. The initial inspection told Captain Yardley HOOVER was hard ashore to starboard, the shore only 500 meters away. The underwater gashes extended from the bow area to nearly to the engine room bulkhead aft of amidships. The seas were running, the wind gusting and the night pitch black. Fortunately, the liner didn't seem to be in danger of sinking, and the risky option of putting the passengers off was postponed for the moment. In the meantime, basic remedial measures were attempted to float the ship off by pumping out fuel oil and jettisoning cargo. The milling passengers were further discombobulated by the fact that right up to the time of grounding they had thought the liner was in open waters and nowhere near shore when HOOVER had shaken so abruptly. The night and mist were so dark the worried men and women did not know what to think the cause was until a lamp from the ship illuminated rocks and shore; literally casting light on the situation. About 0200 Saturday (1300 Friday EST), Captain Yardley dispatched an SOS and ordered the distress rockets fired. Ashore a flurry of brilliant flickers of several bobbing lanterns were seen lighting up from startled inhabitants awakened by the crash. However, for a few hours no one came. Already shaken by the screeches of HOOVER's grounding, the distress flares and further commotion initially scared off any inhabitants. Convinced that the war in China had come to Formosa's shores at last, they fled further inland till dawn revealed the truth of the situation. Meanwhile, the first ship to answer the distress call soon arrived. The German 8,224 ton freighter PREUSSEN's (PRUSSIA) Captain E. Stepnach had intercepted HOOVER's SOS and hurried to the rescue. However, a northeast monsoon was now blowing and the waves remained rather steep. Yardley requested that PREUSSEN standby till daylight when he could better assess the situation for possible towing attempt or to take the passengers off. With daybreak while HOOVER's passengers had a rushed breakfast and were advised to prepare to leave the vessel, the Hoishoto Islanders saw the stranded ship and hastened back out of hiding to come down to help. Meanwhile PREUSSEN took soundings, but Captain Stepnach reported they showed the water was too shallow to approach and towing was impossible. He could only stand guard and could offer little help. The big British liner EMPRESS OF ASIA and the Dollar Line's own PRESIDENT MCKINLEY were also responding, but were not due for some days. Worse, the waves and wind were only driving HOOVER further toward shore. The attempts to refloat her had only lightened her enough to simply drive her harder aground. By the forenoon, HOOVER had been pushed to only 100 meters offshore, and the steamer was starting to markedly list seaward to port. There was growing danger she would lose stability and capsize. The 503 passengers and 330 crew were in growing danger. Captain Yardley ordered the evacuation of all the passengers to take advantage of the onset of low tide. The heavy seas precluded any transshipping to PREUSSEN so the logical step to was to put them all ashore. PREUSSEN was released and hurried to Manila where Captain Stepnach reported the condition of the HOOVER and urged haste; pointing out that when his ship departed the scene a northeast wind of five mph was increasing and the sea rough. Because of the port list the lifeboats were lowered only on the starboard, or landward side. By this time, the islanders in their various powered fishing boats were readily offering assistence; but the task was made difficult by large and now oil soaked waves. A line to shore was thus rigged that would be used to guide the lifeboats once lowered along a straight path to the beach. It was not easy. Boats were winched down from the liner, then after a rough row of some fifteen minutes brought close enough to shore to reach the shallows to unload, before starting back for more people. Much of the crew lacked experience and had difficulty with the oars, and this coupled with some passengers fussiness made the going difficult. Many boats were ineptly handled or filled with only a few passengers. Two lifeboats reportedly capsized during the first attempts to pay the line ashore, then once it was in place, many of the women refused to wade into the oily seas and had to be laboriously picked up by boat and rowed all the way to dry land. It was thirty-six hours after the grounding before the last of the passengers was ashore on Hoishoto. Yet at 1330, 11 December, Saturday, Manila dispatched a message received from Captain Yardley. Given the circumstances, the welcome content of the message was arguably early and very misleading: "All safe. No danger. Vessel aground bow first afloat aft. Some damage forward extent of which cannot be determined at this time. German vessel standing by." Considering that PREUSSEN was about to depart, the pounding of the listing ship, and that offload of passengers had just begun, "All safe" was an overbold potentially premature message. Fortunately, it would hold true. While these first attempts to evacuate were being made, further help arrived in unexpected and perhaps unsettling form in the shape of the powerful flagship of the Japanese Fourth Fleet heavy cruiser ASHIGARA flying the flag of VAdm Toyoda Soemu (Future CinC of Combined Fleet) with one of the destroyers of the Third Destroyer Division (SHIMAKAZE, NADAKAZE, SHIOKAZE.) However they were simply responding to the call. The Japanese warships stood in close to render assistence if required, and to stand watch over the proceedings. Indeed, some reliable reports say ASHIGARA rescued some first-class passengers. In the meantime, early on 11 December destroyers USS ALDEN at Manila and USS BARKER at Olongapo had got word of HOOVER's stranding. They are ordered to depart forthwith, with instructions to secure the potentially sensitive registered mail aboard HOOVER and the passengers from any IJN mischief. Despite the urgency of the situation, because of heavy swells and high winds west of Manila they reported they were making only 12 knots and did not expect to reach the scene before 1330 Sunday (Midnight Saturday Dec 11 E.S.T.) As it happened, the greatest threat of mischief came from the liner's crew itself, not the Japanese Navy. The prior year 1936 had seen a great mariner's strike, with the result that many of the replacement crew were inexperienced and hastily hired men sometimes of dubious character and discipline. The passengers continued to transship to the island, where after a hike of two miles to a small village they spent the night in an uncomfortable haphazard fashion. Most of them gathered within a schoolhouse where Dr. Kenneth Park, the HOOVER's physician, set about tending to the few suffering from exposure, but no lives were lost in the transshipping. The situation Saturday night changed from simply uncomfortable to unsafe when a small but aggressive group of HOOVER crew broke into the ship's bar and became drunk. The intoxicated rowdies then decided to go ashore in search of sport and trouble with the surivors. An incredible and disturbing situation ensued where they began to hunt and go after women passengers. Mostly unarmed HOOVER officers had to form small cadres with stronger passengers to protect the females through a long night. Passengers later complained the situation had been made worse by Japanese island police who had earlier refused to allow armed HOOVER officers ashore. Yet the latter had few weapons anyway, and many of the officers were preoccupied trying to protect the liner's valuables from theft by crew or steerage passeners alike. PRESIDENT HOOVER was eventually pushed by wave action to barely a football field's distance offshore. 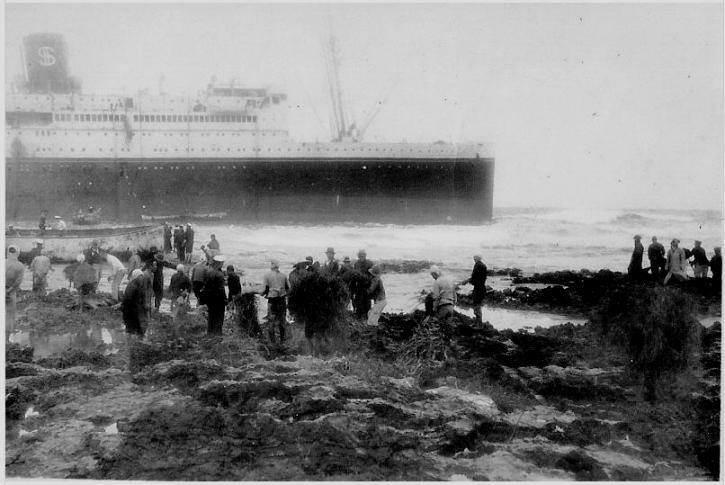 Passengers just offloaded stand on shore in foreground. At 1245, nearly an hour ahead of schedule, USS ALDEN and BARKER arrive at the scene, and signal ASHIGARA for permission to enter Japanese territorial waters. A Japanese officer from the cruiser soon boarded ALDEN and tendered the necessary formal permission to the grateful Americans. Following orders, ALDEN's skipper made a priority of sending two officers and fifteen men to board the crippled liner and secure its specie vault, full of registered mail and other sensitive items. Meanwhile, receiving reports of the ruckus ashore, both destroyers dispatched armed men to restore order and extricate the passengers from further jeopardy. Even so, witnesses later made clear the number of HOOVER crew involved was small and some passengers also got inebriated. The Japanese ships apparently watched this confusing situation ashore with puzzled reserve for they did not interfere, but had sent for further assistance. 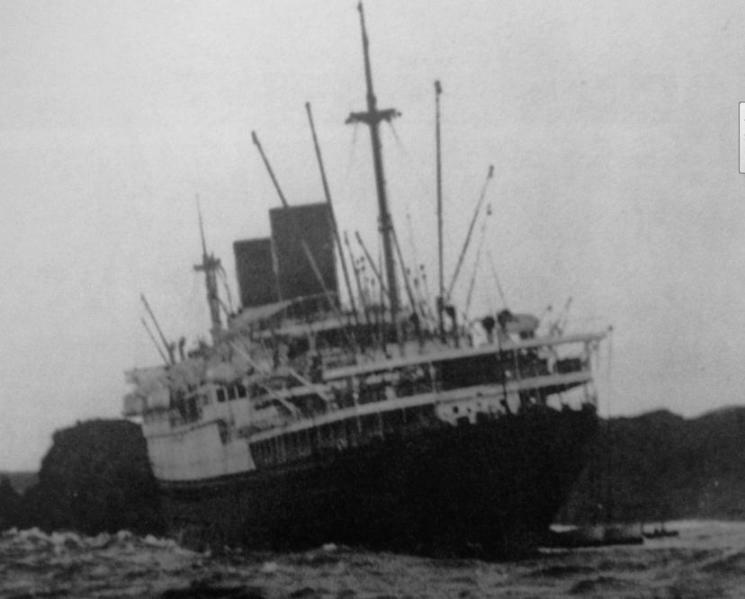 TORIYAMA MARU arrives from Keelung, Formosa with food and necessities for the passengers and crew of HOOVER to tide them over while waiting for removal from the island by a Dollar Line ship. The stricken HOOVER's comrade liner S.S. PRESIDENT MCKINLEY arrives at the scene. The villagers pass the word among the castaways that the big liner is just offshore and will be taking on the passengers the next day. PRESIDENT MCKINLEY stands close inshore to embark the survivors. However, word arrives in the morning of the sinking of USS PANAY by the Japanese two days before, and tensions rise somewhat. The two American destroyers quietly break out and stow in ready racks 4-inch shells, but the precaution proves needless. The two Japanese warships continue to oversee things in a professional and detached manner, and the Japanese helped as promised by using their flat-bottom boats to ferry the stranded people out to a motor launch that then went to the liner or met its own boats. With most embarked PRESIDENT MCKINLEY departs with nearly 700 passengers and crew aboard that day for Manila without interference. Left behind for the moment is some 100 of the HOOVER company of crew and steerage passengers. Quite possibly the same malcontents that had caused the trouble; or perhaps authorities were simply eager for MCKINLEY to be on her way. Another Dollar liner, S.S. PRESIDENT PIERCE arrives to pick up the remaining survivors of HOOVER, including her officers. With this, PRESIDENT HOOVER is formally abandoned, and turned over to watch and salvage efforts arranged by the company. Not a single life had been lost during the incident. The liner had not capsized, but remained stuck fast. USS ALDEN remains on the scene till 23 December. At that date, custody of the wreck is turned over to the Japanese shore police. Reportedly, Robert S. McNamara, later U.S. Secretary of Defense, was a member of PRESIDENT HOOVER's crew at the time, having joined as a summer stint while a student. To date no good explanation has come to light about how PRESIDENT HOOVER's course came so dangerously close to a major landmass. Passengers noted that if she had not hit the shoal and stopped when she did, she simply would have plowed directly into a rocky islet in front of her. There are no reports of steering failure or any such contributing mishap, and it is probably only the Dollar Line's own major fiscal troubles following immediately after that caused the staggering human error involved to remain so relatively unexplored. Also still unclear was the reason for her orders to hasten so to Manila. Some news wires such as the Sydney Morning Herald - Dec 13, 1937 - report the fascinating fact said that Tokyo had reported that the cruiser had taken off 200 of the first-class passengers to Hayake Island. This `real-time' mention is unverified. Other accounts conflict but since Ashigara's report of this incident is not to be found, it cannot be ruled out. A Japanese resident of Formosa writing in the following month made mention that apparently Ashigara dispatched a landing party to guard the passengers and property at one point till the American destroyers could arrive. If so, it is probable this was morning of 12 December after Toyoda learned of the commotion ashore Saturday night. Just after the HOOVER mishap, in gratitude to the islanders for their assistence during the incident in 1938 the U.S. moved to fund through the Red Cross a 33-m high lighthouse's construction near the grounding site. To this day, the Lyudao Lighthouse is considered one of the most beautiful landmarks on Green Island.